Two weeks before Christmas, a murder is committed in a small Mississippi town and the local busybody searches for the culprit in the delightful sleuth mystery, Death at the Midnight Dragonfly (Lily Gayle Lambert Mystery #3) by Susan Boles. Lily Gayle doesn't have the Christmas spirit this year, and recent events aren't making it any better. Vlad, a friend from Lily Gayle's and her best friend Dixie's childhood, has returned to town and taken up residence at the Midnight Dragonfly Inn. The morning after the annual Mercy Christmas party, the bank manager is found dead on Vlad's front step. The elderly and crotchety Miss Edna is in jail for tampering with the victim's drink, but surprisingly it is Dixie's husband, Jack, who is under suspicion for his murder. Not having heard from Vlad since their early teens, Lily Gayle isn't so sure he isn't guilty, but she is darn sure Jack is innocent. Even though Ben Carter, the Sheriff, and Lily Gayle's cousin, has warned her to stay out of his investigation, she blatantly ignores him. Pairing up with Dixie, Lily Gayle continues her snooping and sets out to find the killer, even if it means putting an old friend behind bars. 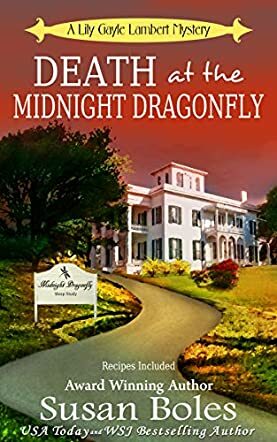 Death at the Midnight Dragonfly (Lily Gayle Lambert Mystery #3) is an engaging murder mystery with an obstinate and nosy genealogist who gives Agatha Christie's Miss Marple a run for her money. Filled with euphemisms inundated with the flavor of the deep south, it brings back heart-warming memories from my own youth; without the murder, of course. The plot is so well founded that it makes you feel right at home, and with lovable and cantankerous characters like Lily Gayle and Miss Edna, you don't want the story to end. This is the third book in a series, but even if you haven't read the first two, you can't get too lost. This series can be addictive and I put the book down wanting more. This cozy mystery is an enchanting and humorous novel that will delight amateur sleuth fans of all ages.